I just love it when the gods of serendipity strike: (1) supper needs deciding, (2) a perfectly appealing something shows up online from a favorite source and (3) aha! all the ingredients are already on hand ... including a disk of pastry, to boot. So all of two minutes passed between seeing this quiche recipe on Albion Cooks (whose inspiration you'll see more of, I predict, given our similar sensibilities to food) and heading to the kitchen. It was delicious! This is a keeper! FOR THE RECORD ... I started making pastry when I was 16 and for a lot of years, made one tender crust after another. Then a couple of years ago, I lost the knack and turned out one TOUGH crust after another. (And no, those weren't the boxed crusts. The boxed crusts started to taste pretty good!) Whew! I'm finally creating good pastry again, thanks in part to re-incorporating Crisco or lard and adopting a few Alton Brown techniques. This pastry was tender and flavorful and hard to resist! It includes a bit of semolina which both adds gluten and a thin understory of crunch that's appealing in savory dishes and I suspect, some fruity pies like apple. What's semolina? It's a more coarsely ground wheat flour and is often used in pasta. I've successfully used farina (aka Cream of Wheat) as a substitute but it doesn't impart the same nuttiness. BUT IF YOU'RE SHORT ON TIME OR AREN'T INTERESTED IN PASTRY ... I really do recommend the Pillsbury refrigerated pie crusts. You can use them as is. But better yet, roll them out to be thinner, put the pastry into the pie tin and cut away the excess before crimping the edge. You'll save a few calories and the crust won't be quite so well, crusty. If you have semolina on hand, maybe try rolling it in semolina, to impart a bit of that special nutty flavor. (NOTE: This is the Alton Brown technique for pastry.) In a food processor, whiz the the flour, semolina and salt two or three times til mixed. Add the Crisco and HALF the butter; whiz two or three times til small crumbs form. Add the remaining butter and whiz two or three times until coarse chunks form. DON'T SKIP THIS STEP, it prevents overworking the dough: Transfer to a working bowl. A tablespoon at a time to start, add water and gently mix into the flour-butter mixture with a wooden spoon until the dough can just be gathered together. Gather it into a ball, press flat to create a thick disk, wrap in plastic and refrigerate for at least 30 minutes. Generously sprinkle a work surface with flour. Working quickly, use a floured rolling pin to roll out the pastry, working from the center out and turning the pastry a bit after each roll. (I usually turn it over once or twice as well.) When it's the right thickness, fold in half and then again. Transfer to a lightly greased quiche pan, letting the edges hang over the sides. Fold the pastry over itself, then pinch the edge between to form a fluted edge. Refrigerate for 30 minutes or tuck into the freezer for about 15 minutes. In a large skillet, melt the butter til shimmery on MEDIUM HIGH. Reduce the heat to MEDIUM, add the onion and red pepper, sauté til beginning to soften but not brown. Add the parsley, garlic and marjoram and cook 1 minute or two. A handful at a time, add the spinach, letting it cook down a bit before adding more. Season to taste. Spread the feta on the bottom of the cold crust. Gently arrange the spinach mixture over top. Whisk together the eggs, half 'n' half and salt and pepper, then gently pour over spinach. Bake for 40 - 45 minutes or until center is set. Let rest for 5 - 10 minutes before cutting to serve. Looks lovely with the red pepper! lard? like, from animal fat? yes, Anon ... lard makes the most luscious pastry ever. And BTW just in case you're wondering, A Veggie Venture is all about vegetables not vegetarian food. Living in a veritable city of quiches, it has become a favorite and spinach quiche tops my list. This looks divine. Good tip on rolling out the store-bought dough, too, if you have to use it. 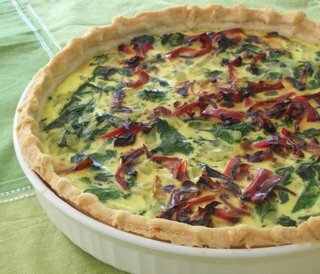 (Try adding flaked salmon to your next spinach quiche - so good!! and so French. =) Thanks! Gross. You should really make that clear. Newbie vegetarians may not be aware of animal ingredients in products like lard or rennet. Your blob title is misleading. First you appropriate someone else's recipe, now this. It looks fabulous! I'm married to a meat and potatoes man, sigh, who would think that quiche recipe would be nice...for breakfast..but then again, off with his head! I'm making it sometime this week anyway. God, I miss quiche! Anonymous: vegetarians eat animal products (unless you are forgetting, this recipe also calls for eggs and cheese). It's not misleading, you're just mistaking vegans and vegetarians. Anonymous ~ Oh my, you have completely made my day with your comment, thank you so-so much for making the time to write. Feta, asparagus and fresh tomato? No WONDER your quiche was good! The quiche is baking in the oven now and I'm sure it'll be delicious. One comment, I read and reread your directions, but didn't see when to add the red pepper. So I added it when I added the spinach. Karen ~ Good catch, thanks for letting me know, I've corrected the recipe. I hope that your quiche turned out well! I can't wait to try this as quiche is one thing everyone in this house will eat! My question is, how many points if I just skip the crust? I'm a "recovering Atkins addict" and have learned to love my quiches without crust...saves a lot of points, but I'd love if you could tell me specifically how many points I'd save-thx!! Hi Megan O ~ I'm not in a place where I can re-calculate the points but can estimate, based on a couple other recipes, that the filling is about 3 points. I hope you enjoy it! I've been meaning to remake this, it's definitely on the list!